Did Colonel Winty [J. T. Winterich] send you his pamphlet, "Clio and My Aunt Bertha?" He comes God-damned near being my favorite author. The Letters of Alexander Woollcott (386). John T. Winterich may not be my favorite author of all time. But he is my favorite author of late. In the last month alone, while researching and preparing this blog post, I have reread several books he wrote, and bought three more books by him that I had to have for my library. And that does not include the mother lode of Winterich's writings I found on the web; 197 pages in all: The First R and Related Enjoyments, an unpublished book I bought from Michael Manz of Yesterday's Gallery & Babylon Revisited Rare Books. 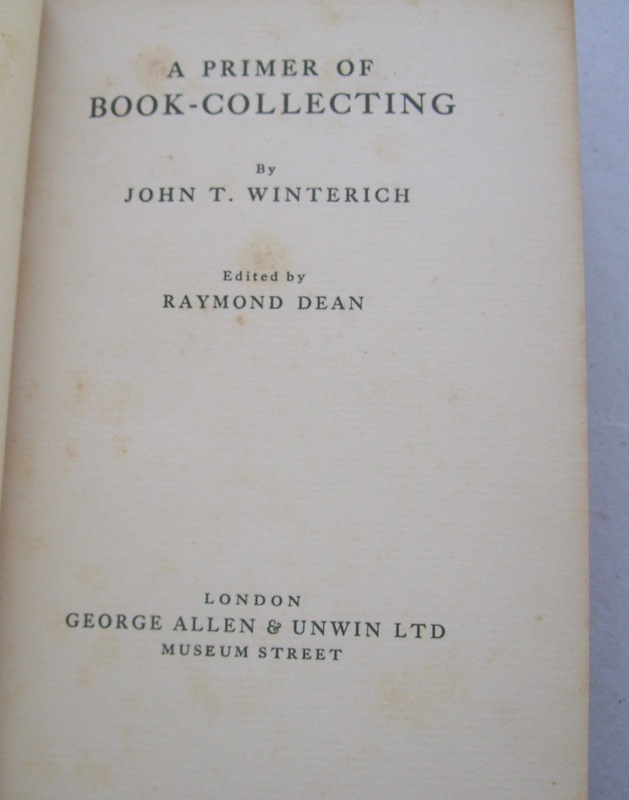 I have always thought of John T. Winterich (1891-1970) as a man who wrote books about book collecting. But I now know that he was more than a bookman. 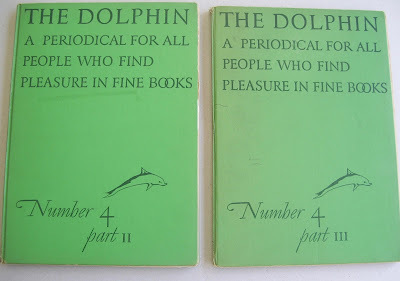 He was a freelance writer, and an editor of a number of newspapers and magazines. And in his early editorial endeavors, he had a veritable army of readers. 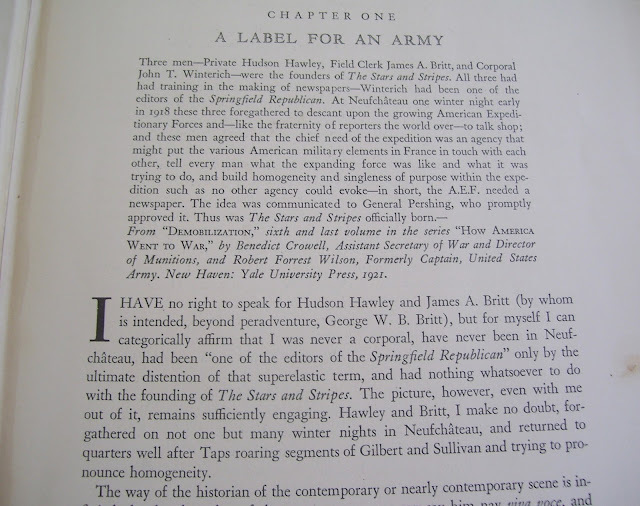 In the 1921 book, How America Went To War, "Corporal Winterich" was identified as one of the founders of The Stars and Stripes. 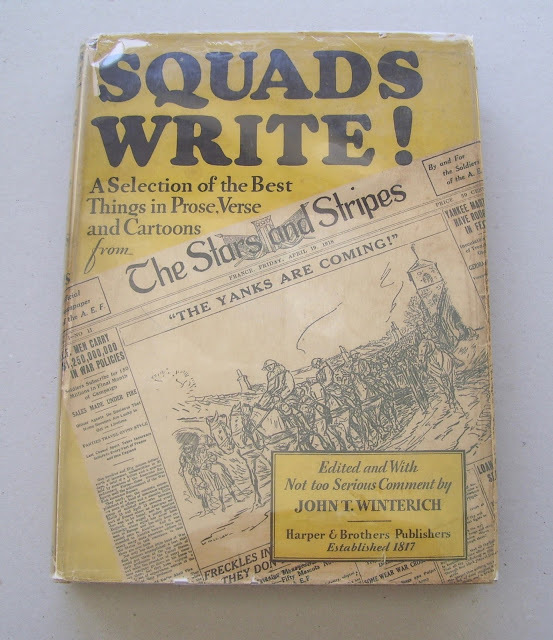 But on Page 1 of his 1931 book, Squads Write!, Winterich stated that he was never a corporal, and had nothing whatsoever to do with the founding of The Stars and Stripes. But work on the paper he did. With General Pershing's blessing, newspapermen were pulled from the ranks and reassigned to Paris to publish a newspaper, the purpose of which was to keep the soldiers of the American Expeditionary Forces informed. 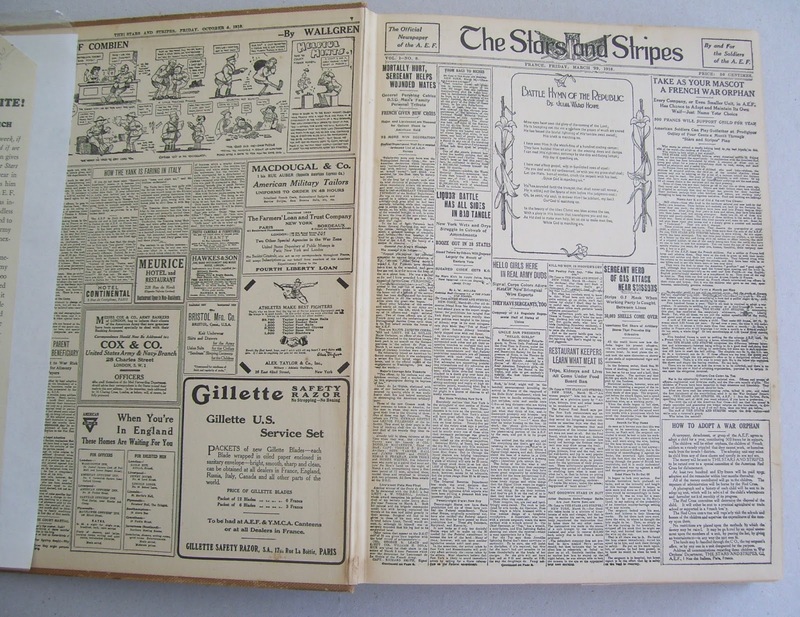 The Stars and Stripes was two weeks old when Private John T. Winterich, 496th Aero Squadron, and former editor of the Springfield Republican, joined the editorial staff. Two days earlier, Private Harold Wallace Ross, already a seasoned newspaperman, had joined the staff. 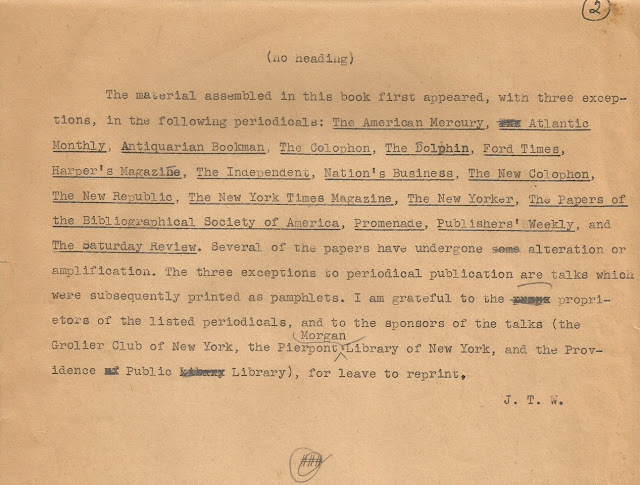 Joining them shortly afterward were Sergeant Alexander Woollcott, drama critic for the New York Times, Captain F. P. Adams from The New York Tribune, and Private Abian A. "Wally" Walgren, cartoonist, from the Washington Post and the Philadelphia Public Ledger. Seventy-one issues of The Stars and Stripes were published between Feb. 8, 1918 and June 13, 1919. And the paper's circulation climbed from 30,000 copies to over 500,000 copies. Some of the staff of The Stars and Stripes put themselves in harm's way in order to gather the news of the war. Four members of The Stars and Stripes staff died while serving their country. 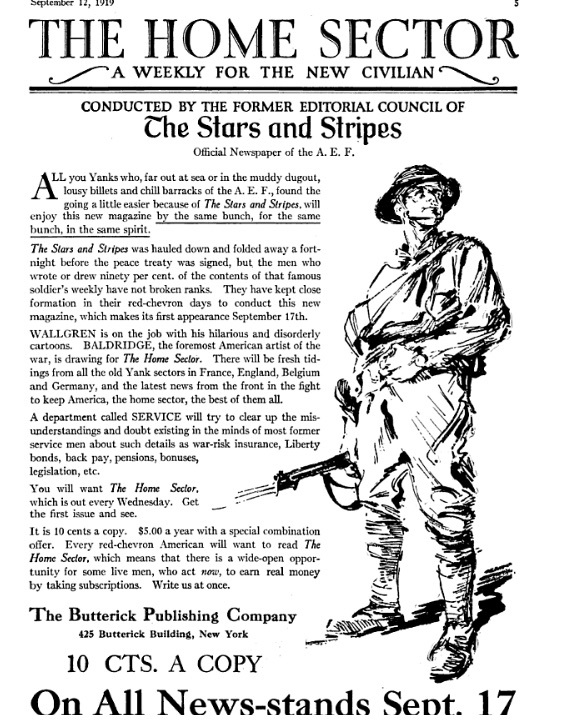 After WW1, Winterich, Ross, Woollcott, and several other members of The Stars and Stripes editorial staff went to New York and started The Home Sector: A Weekly for the New Civilian. The Home Sector failed seven months later after a crippling printers' strike. And Winterich followed Ross on to the editorial staff of The American Legion Weekly. Ross left The American Legion Weekly in 1925, and co-founded The New Yorker. But Winterich didn't quit his day job, remaining with The American Legion until 1938, at which time he joined Ross at The New Yorker. 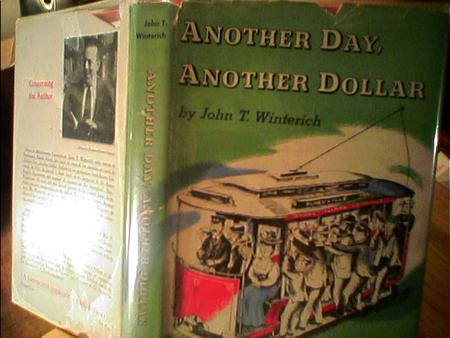 Surprisingly no one has written a book about John T. Winterich—at least I haven't found one. The closest thing to a biography of him is his own 1947 book, Another Day, Another Dollar, a series of articles mostly about the many jobs he had before, during and after he graduated from Brown University in 1912: from a water filter salesman to a delivery boy to a trolley car conductor. Many of these articles first appeared in The New Yorker. 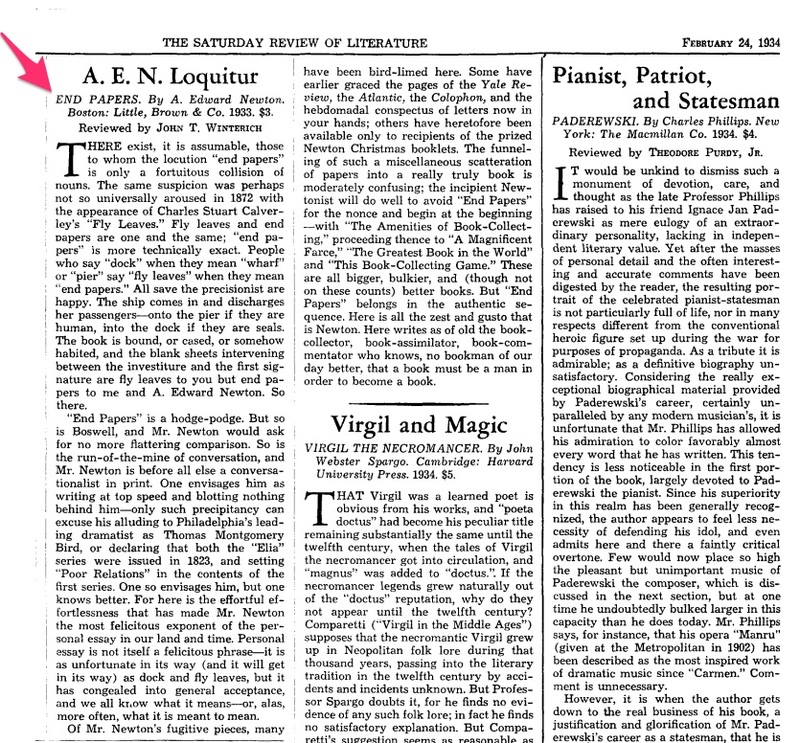 "Clio and My Aunt Bertha," however, was first published in the Saturday Review of Literature. And yes, I have a copy of Clio and My Aunt Bertha heading my way. 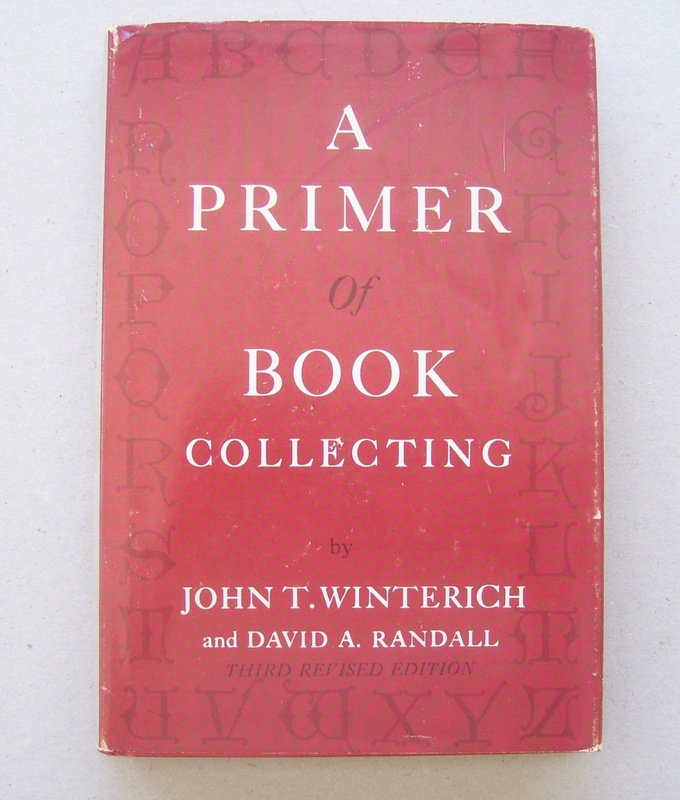 John T. Winterich's first book, A Primer of Book Collecting was published in 1927. 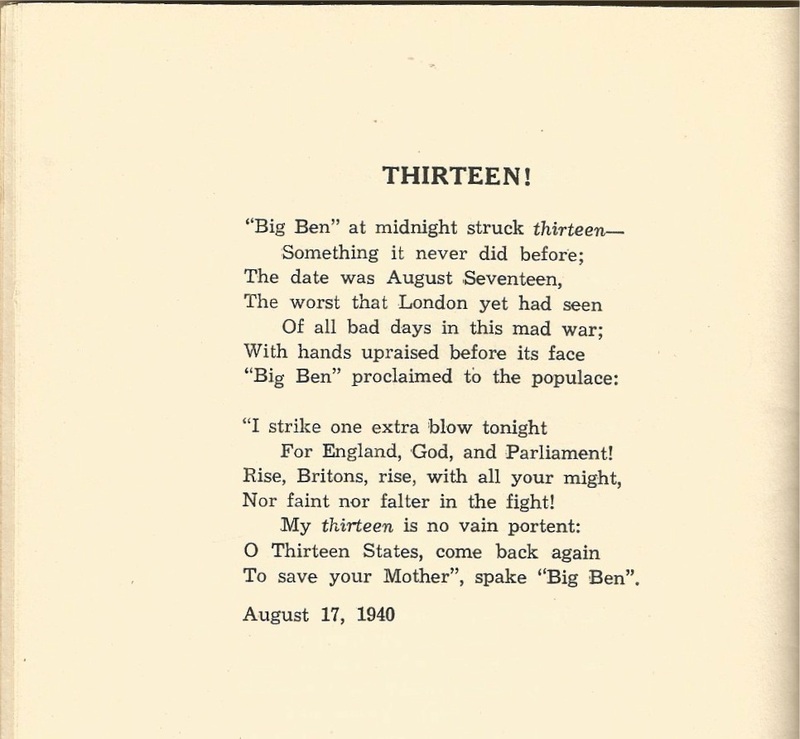 I have the London edition, which was first published in 1928. 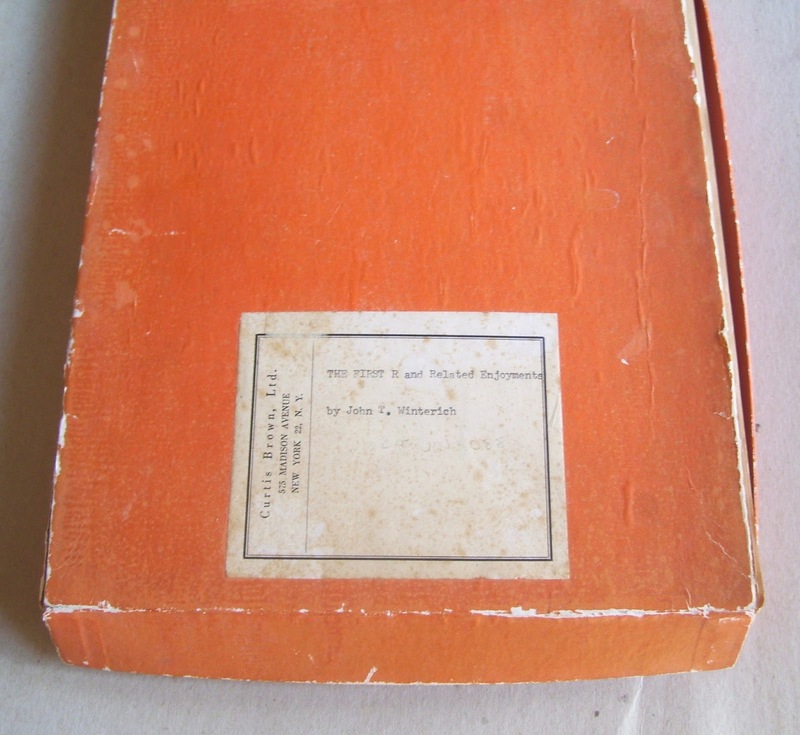 And I recently acquired the 1966 third edition of the American edition, with David A. Randall listed as co-author. The English London edition, written for the English book collector, was edited by Raymond Dean. The format of the book remained the same as the American edition. 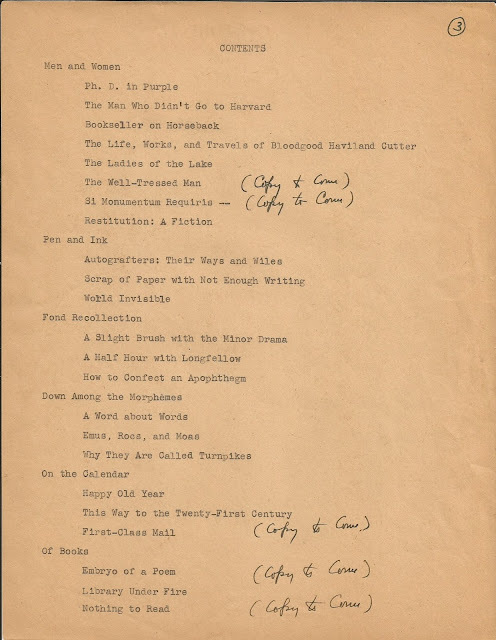 But Dean substituted the titles of English books and the names of English authors for many of the American books and authors that Winterich cited in the American edition. 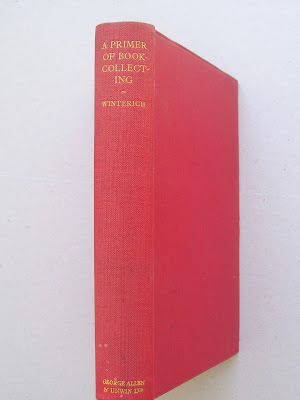 One chapter in the American edition, "Dollars and Cents," was renamed "Books as an Investment" in the English edition. 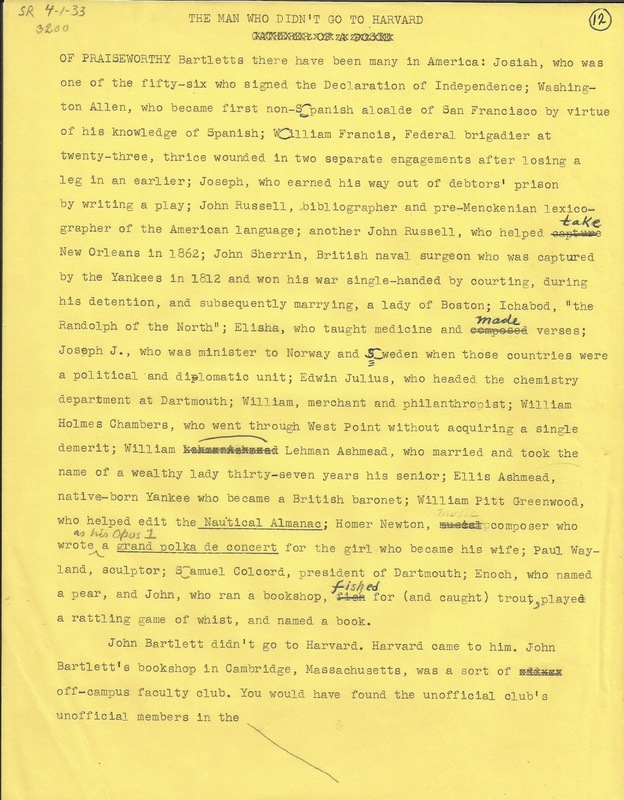 And I have it on good authority (COPAC) that "Raymond Dean" was a pseudonym for Wilfred Partington (1888-1955), author and editor of Bookman's Journal. 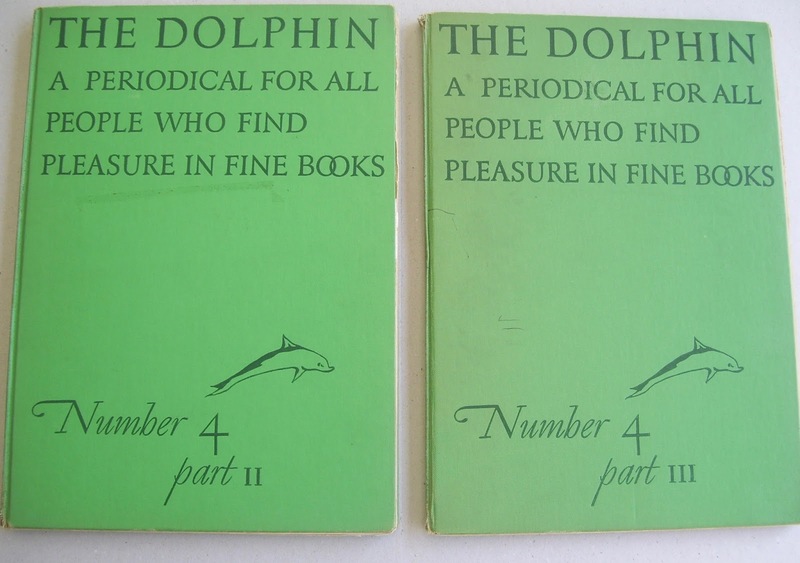 The format of the third edition is the same as the first edition. But Winterich and Randall updated some of the authors and books cited as examples. Major A. Edward Fisher was not on the staff of The Stars and Stripes. That I can tell you. And I don't think Winterich and Fisher were ever in jail together. I believe the phrase, "from his old cell-mate," implies that Winterich and Fisher worked closely together; but not in WWI. I believe they worked together in the 1940s. But more on that later. Picture the portentous consternation of Samuel Johnson on turning the crisp leaves of his "Dictionary of the English Language" (London, 1755), and finding toward the end of Volume II, that the letter V followed T, and that the words under U began to filter in a few pages later without the dignity of being announced (86). That was no error. And the reason was explained in the 1755 issue of the dictionary itself, and in many other editions of Johnson's Dictionary. 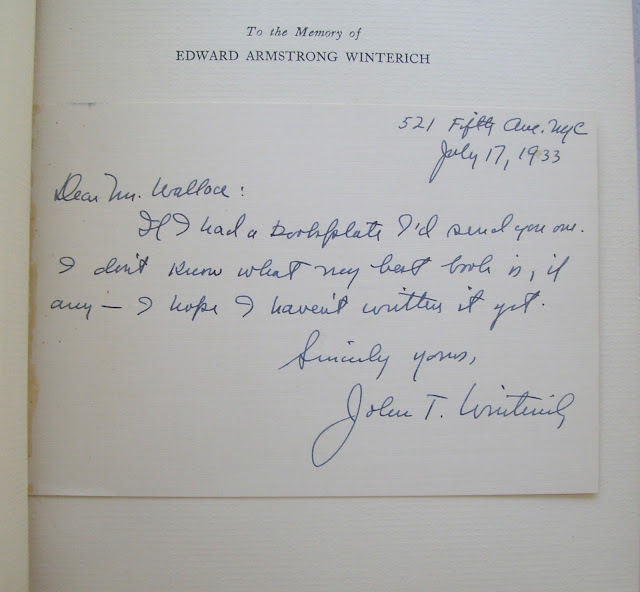 As far as I can tell, that may have been the only bookish error Winterich ever committed. 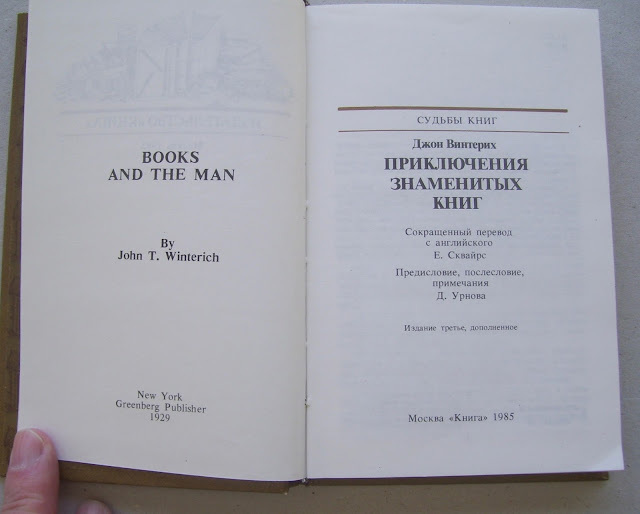 John T. Winterich's third book, Books And The Man, was published in 1929. My copy belonged to a Mr. Wallace, who tipped in an index card he received from Winterich. And no, I have no clue who Mr. Wallace was. 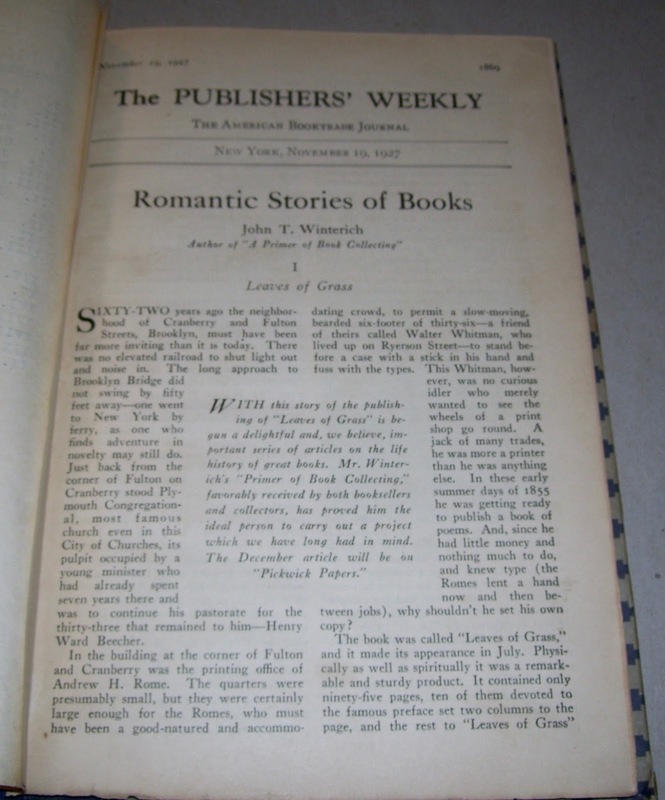 Books and the Man contained greatly expanded versions of the first series of articles that were published in Publishers' Weekly from Nov 27, 1927 to Jun 15, 1929. The articles were published under the title, "The Romantic Stories of Books." 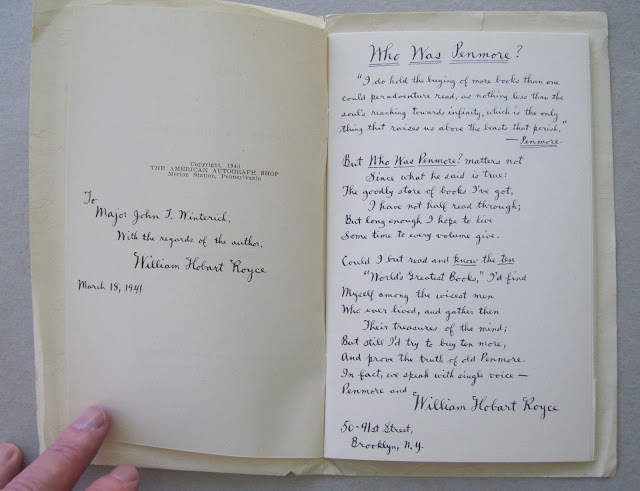 An enterprising librarian at Michigan State Normal College, Frederick B. Cleveringa, made his own copy of "The Romantic Stories of Books" by binding together the articles as they appeared in the periodical. 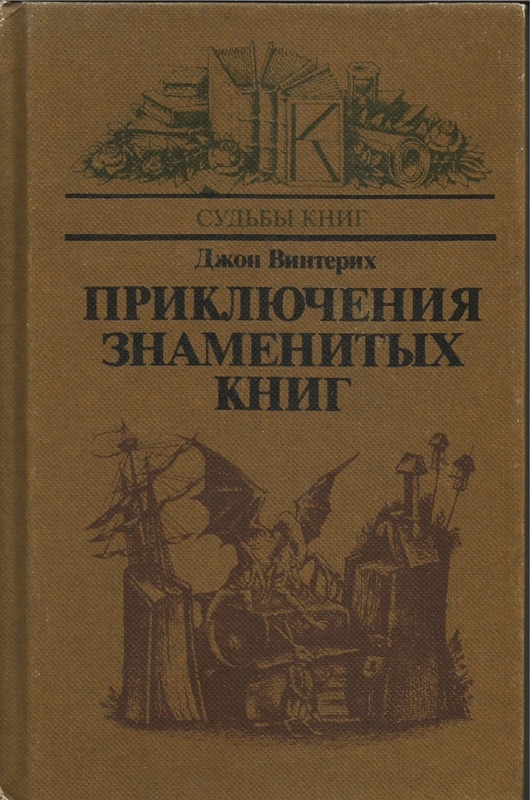 I recently discovered a Russian edition of Books and the Man on eBay. And I just had to have it! Now to get the Chinese edition! I think Winterich's book, Early American Books & Printing, was the best book he ever wrote. 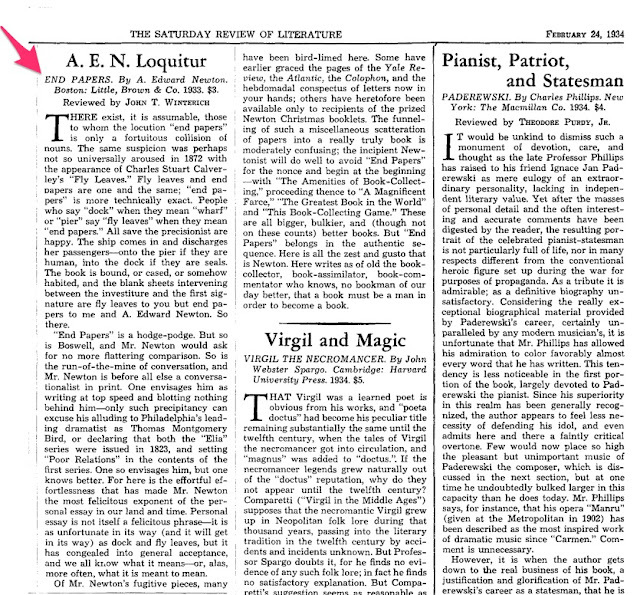 Published in 1935, the book covers not only early American books, but magazines as well, and on a more scholarly level than his earlier books All but one of the articles previously appeared in either the Publishers' Weekly or the Saturday Review of Literature. I own several books by Winterich. And one book about him—that he wrote himself. But until last month, I did not have a book he formerly owned. 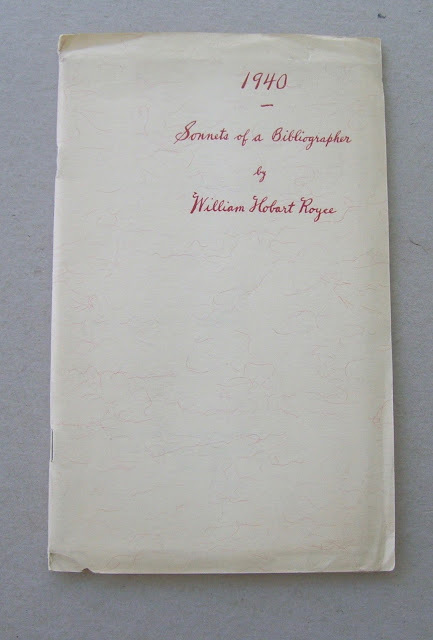 I have the Santa Clara bookseller Robert Perata to thank for selling me a copy of 1940 - Sonnets of a Bibliographer by William Hobart Royce: a book of poems that was inscribed to Major John T. Winterich by the author. Major John T. Winterich? More on that shortly. Royce is one day too soon in his sonnet, The next day, August 18th, is known as "The Hardest Day" in the Battle of Britain. But capture the mood of that day, he did. By 1940, President Roosevelt had convinced Congress to activate several reserve units. And the U.S. Army Signal Corps Reserves, which Winterich belonged to, was one of the units activated. Winterich had rejoined the army, not as Private John T. Winterich, but rather as Major John T. Winterich. And in October 1940, shortly after he was activated, Major John T. Winterich was reassigned to the War Department in Washington D. C.
Now one can surmise that Major Winterich's writing skills and knowledge of the publishing industry made him better suited to working in the War Department than commanding troops on the front line. But there was a more compelling reason for the reassignment: tragedy on the home front. In July 1940, while at summer camp in Westchester County, Winterich's eleven year old son George got an infection in his fingers and died of blood poisoning. Winterich may have thought a change of scenery from Ossining, New York to Washington D. C. would be best for himself and for his grieving wife. 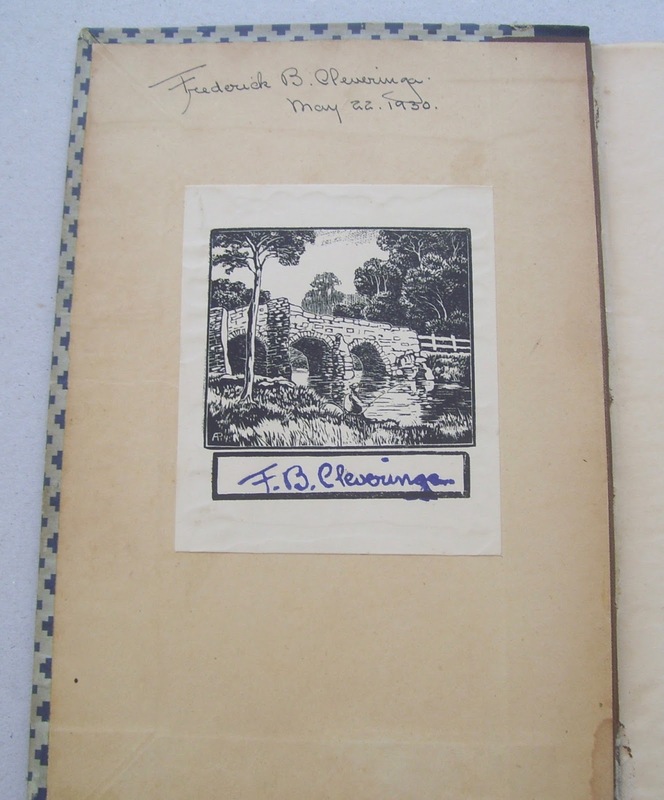 It may have been our "Major A. Edward Fisher" who arranged for Winterich's reassignment. There was a friend of Winterich's who was a major in the regular army, and who ran a small unit in the War Department. His primary mission was to provide details about the Army's Procurement Programs. But one of the major's secondary responsibilities was to write speeches for high ranking military officers. And the major "hired" Winterich to be a ghost writer and write speeches for the military brass. 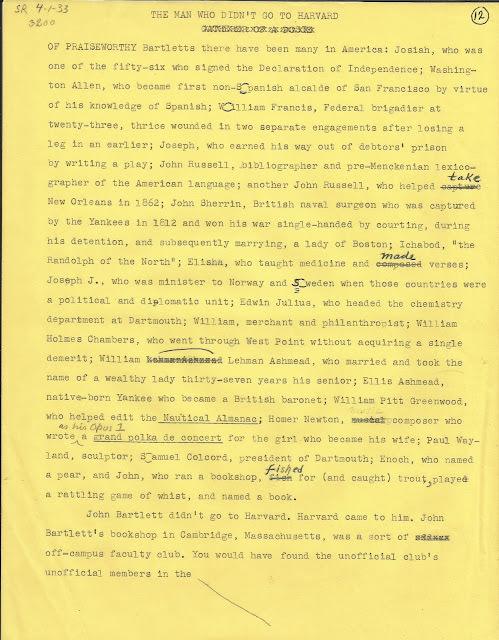 Winterich revealed all this in an entertaining article which first appeared in The New Yorker on October 2, 1948 under the title, "Not in Stevenson." 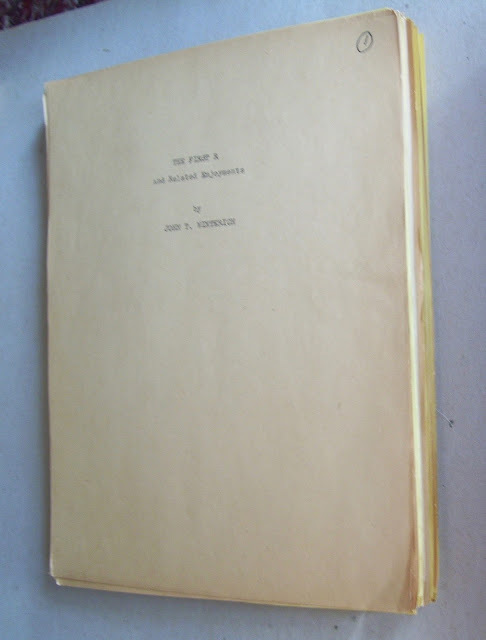 The article, renamed "How to Confect an Apophthegm," and with minor changes, is part of Winterich's unpublished book, The First R and Related Enjoyments (more on this book later). But nowhere in the article does Winterich identify the major by name, simply identifying him as "The Major." 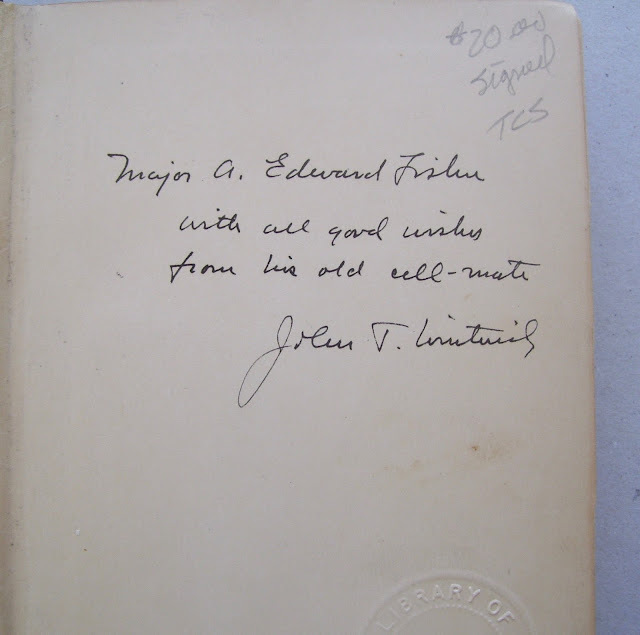 Was it Major A. Edward Fisher who arranged Winterich's reassignment? We may never know. Not long after, Major Winterich became Lt. Col. Winterich, and then Col J. T. Winterich, and was in charge of the Public Relations Bureau of the United States War Department during the war. After the war, Winterich became the editor of the Saturday Review of Literature, and remained there as managing editor until shortly before his death in 1970. That was his day job. He continued moonlighting, still writing articles and editing periodicals, from The New Colophon to The Dolphin: A Periodical for All People Who Find Pleasure in Fine Books. I have a reprint of an article about the history of The Colophon, which appeared in the Nov 22, 1947 issue of Publishers' Weekly. 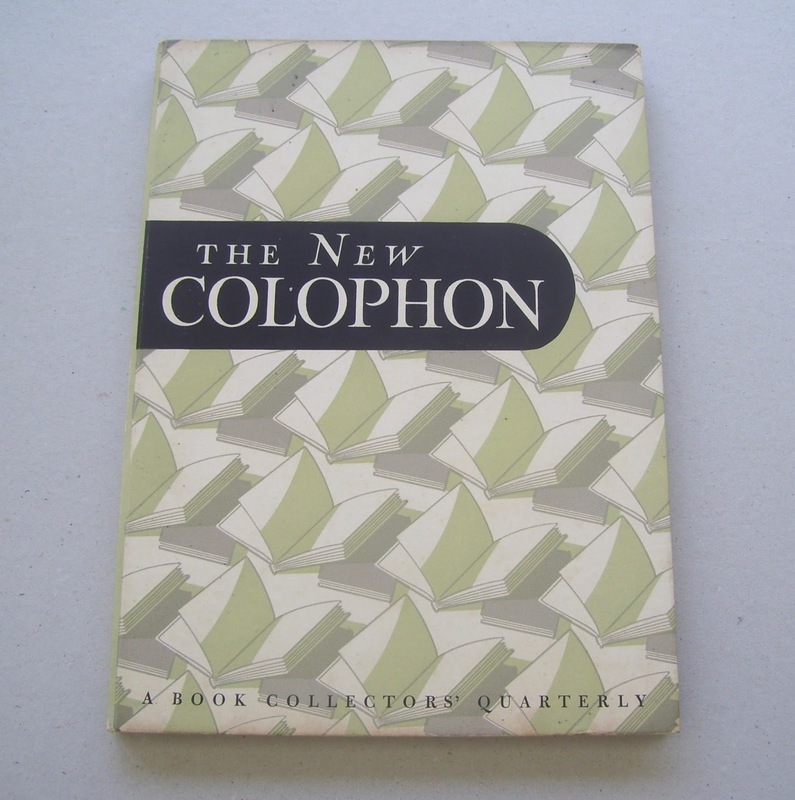 John Winterich, Elmer Adler, and F. B. Adams Jr. were the founders and editors of both The Colophon and The New Colophon. 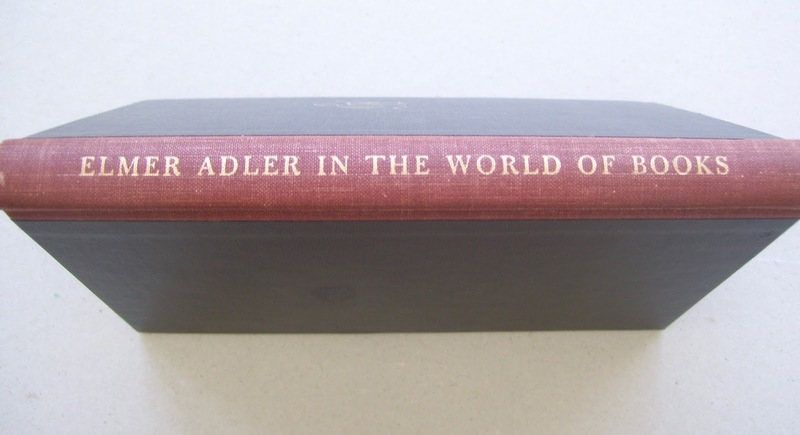 The book world remembered Elmer Adler after he died, writing reminiscences of him in a 1964 book titled, Elmer Adler in the World of Books. 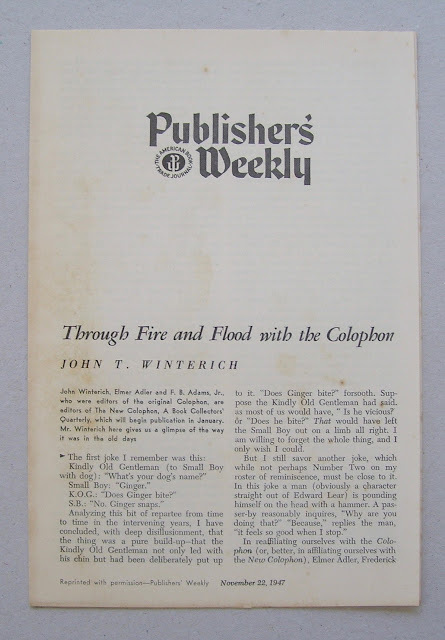 Winterich contributed the chapter, "Elmer Adler of The Colophon." As for Winterich, two more of his books were published after the war. 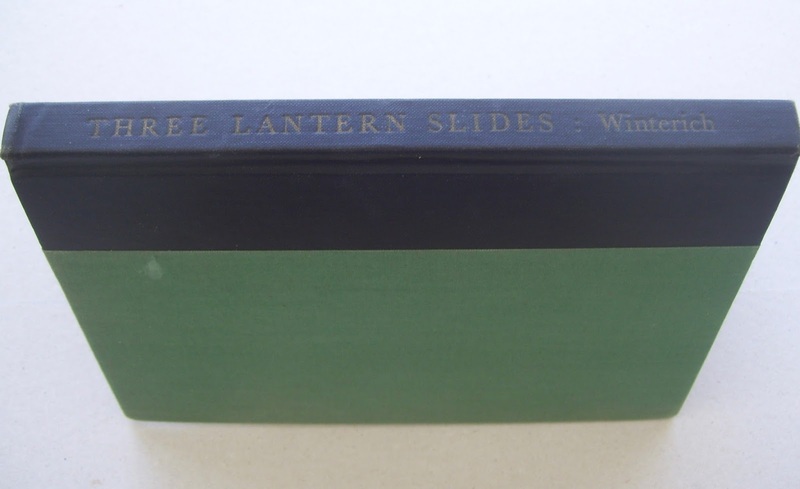 And he dedicated the first book, Three Lantern Slides, to Elmer Adler. The subtitle, Books, the Book Trade, and Some Related Phenomena in American: 1876, 1901 and 1926, explains what the subject matter of the book was about. 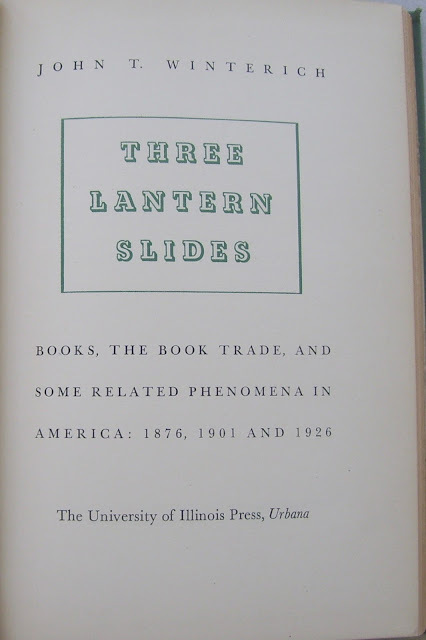 Published by the University of Illinois Press, Urbana in 1949, the material was presented by Winterich in March 1949 as, in Winterich's own words, "the first fruit," of the "Phineas L. Windsor Lectures in Librarianship." 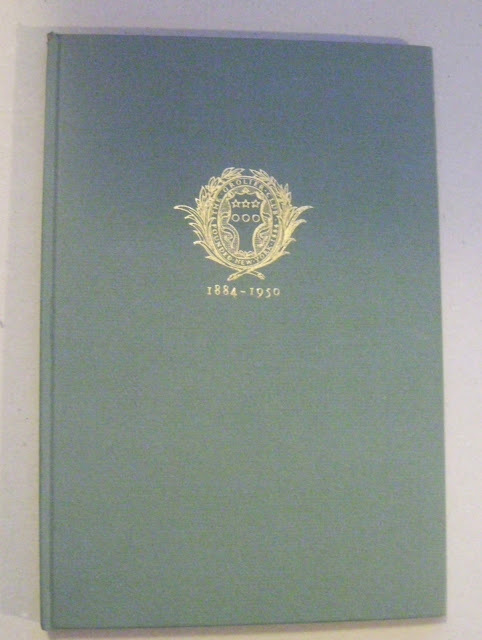 Winterich's book, The Grolier Club 1884-1950 An Informal History, was published by the Grolier Club in 1950. 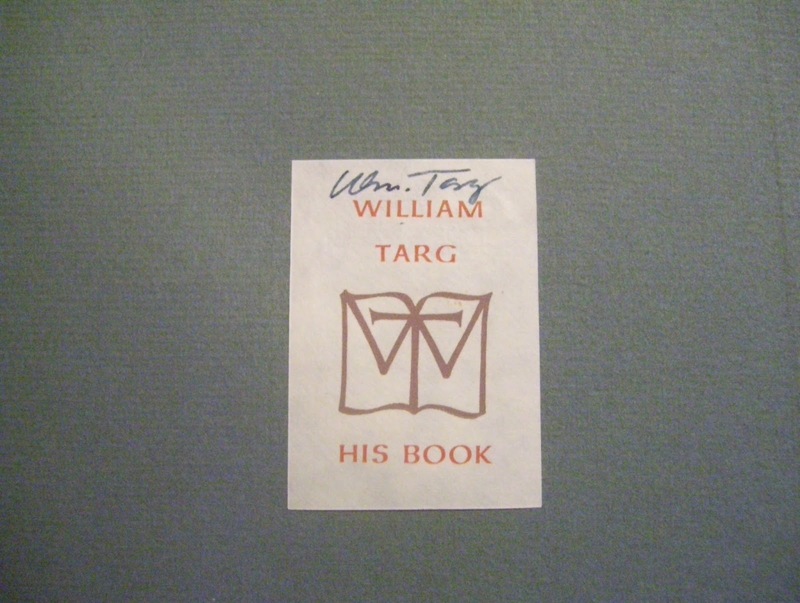 And William Targ was the former owner of my copy of the book. 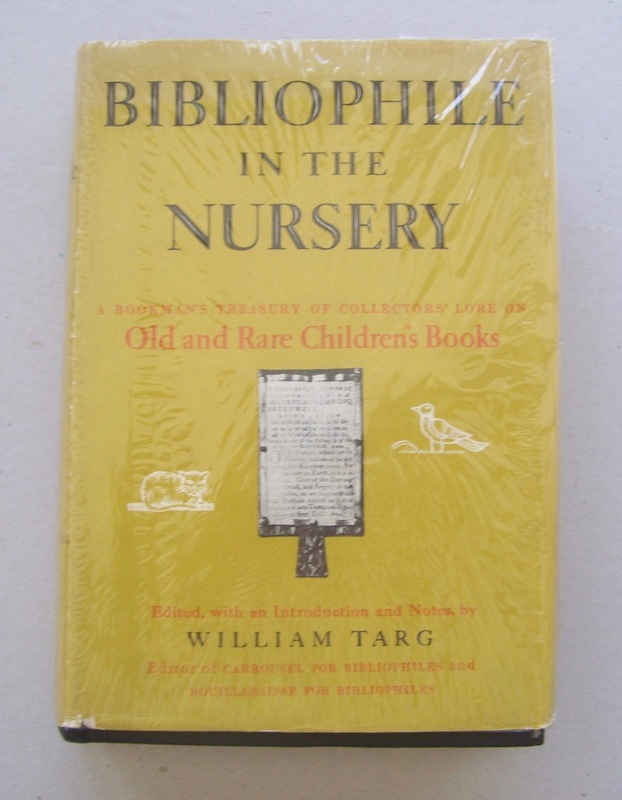 Winterich's article on John Bunyan and The Pilgrim's Progress, which was first published in Publishers' Weekly, and then in Winterich's book, Books and the Man, was included in William Targ's book, Bibliophile in the Nursery. Somewhere, and just in this last month, I read somewhere that Winterich said he found The Pilgrim's Progress to be a book that was too hard to read. But darned if I can find where I read that! 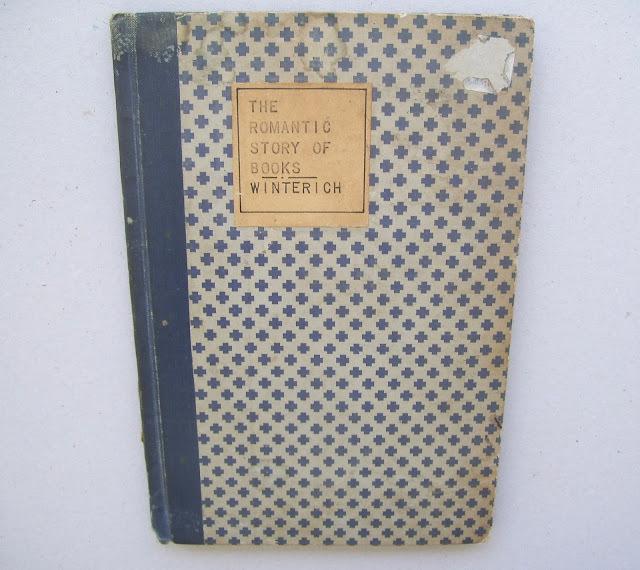 I find it more amazing that Winterich may have written pages and pages about a book that he never read. 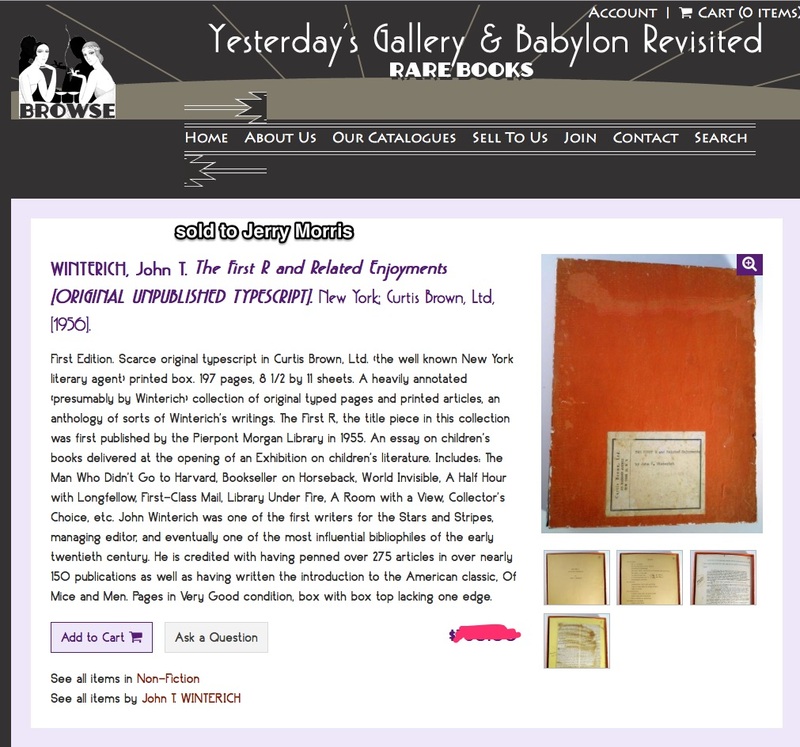 One book I thought for sure that I already had in my library—and I've had at least one copy in my hands in a bookstore or at a book fair—is New Paths in Book Collecting by John Carter. 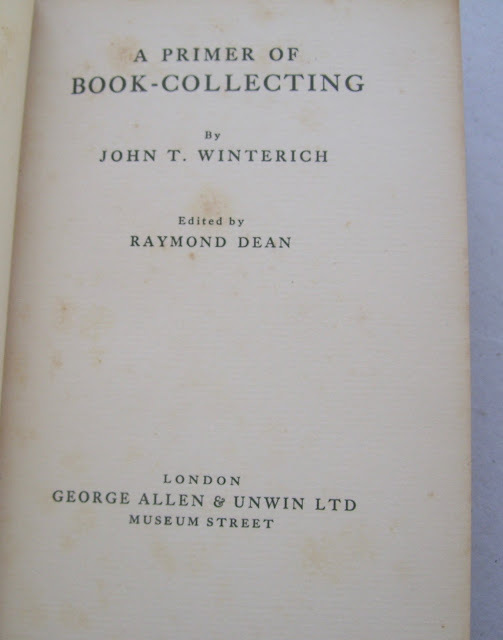 This book contains Winterich's article, "The Expansion of an Author Collection." 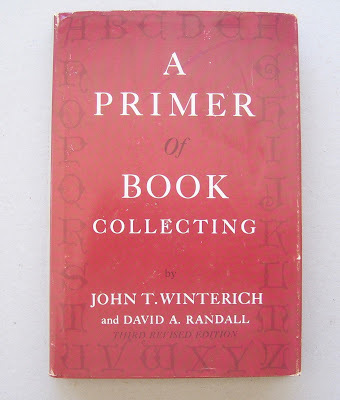 Now since I've already expanded my John T. Winterich Collection, I think I should read Winterich's article just to see if I followed his advice. And yes, a copy is already heading my way. 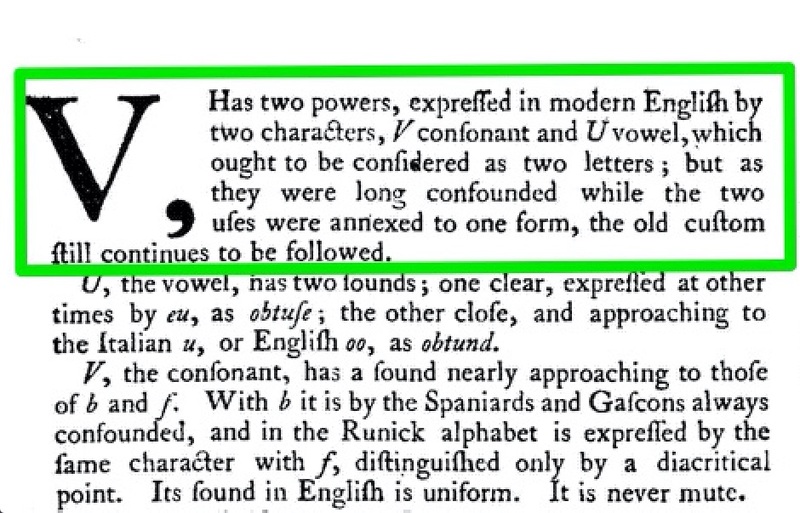 I'm surprised that Winterich's book, The First R and Related Enjoyments, was never published. 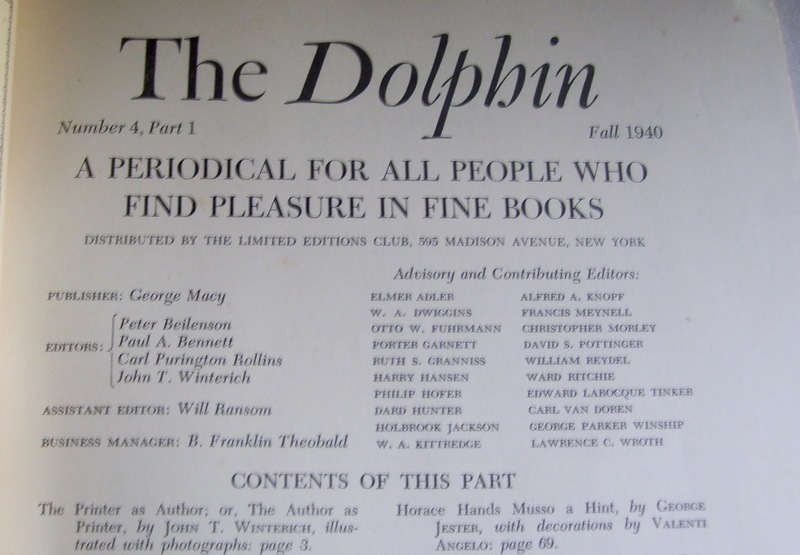 It contains 22 articles, some bookish, some not, and most of them were previously published in periodicals from the 1920s to the 1950s. 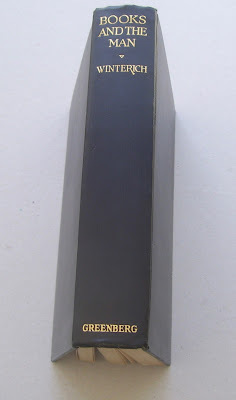 The articles are still stored in the manuscript box pictured below. 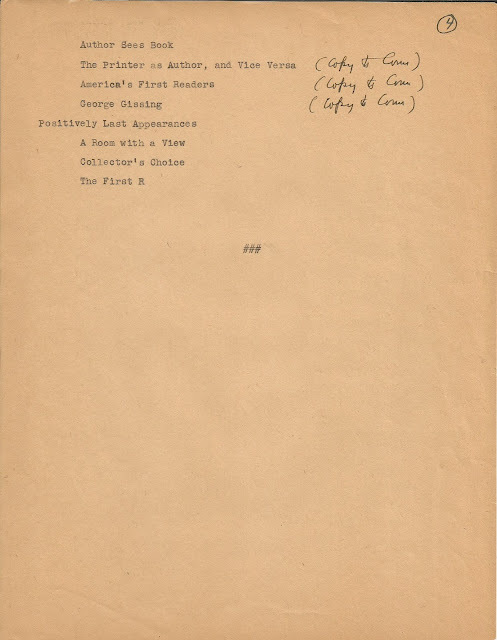 The eight articles marked "copy to come" were never added to the manuscript. Some of the articles were typed and then revised. And a few of the articles were typed on The American Legion Weekly stationery. All but one of the 22 articles present in the box were revised. 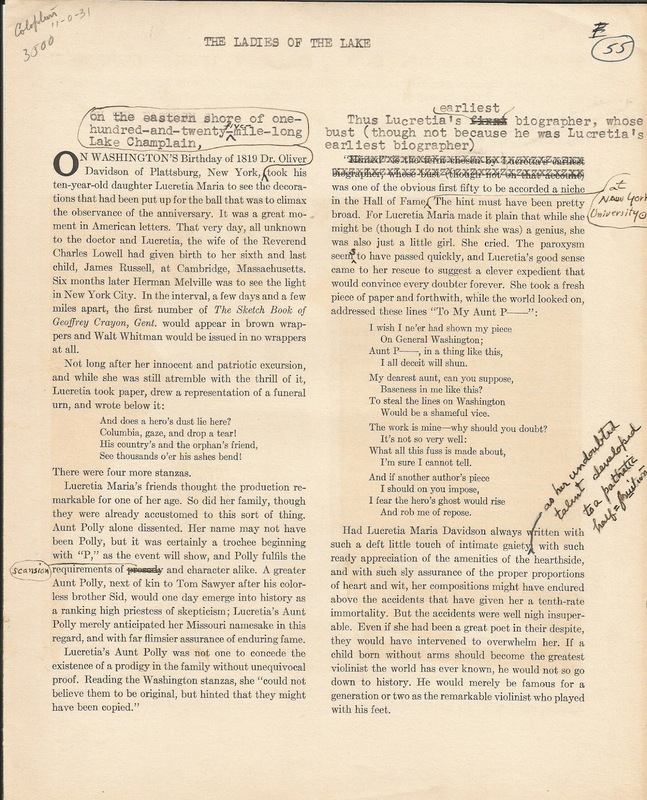 Some of the articles were cut out of copies of the periodicals in which they appeared, and then pasted on backing sheets. And yes, I have a conservation issue to resolve. Winterich used acidic glue to paste down the articles that were taken from the periodicals. 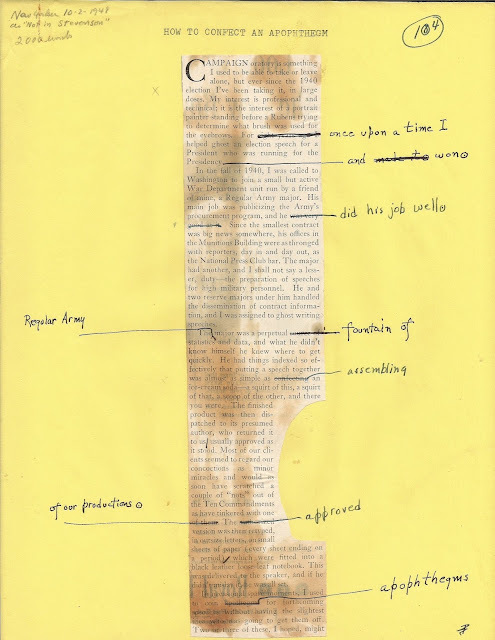 And the glue has bled through the paper, browning the articles. I have a choice of whether to store the 197 pages in the manuscript box where they've been for over fifty years, or to place each page in an acid free sheet protector, and store them in a binder. I am leaning toward the acid free sheet protectors.. But I am open to suggestions. At any rate, I am thankful that John T. Winterich's unpublished book, The First R and Related Enjoyments is part of my John T. Winterich Collection. And I will be writing more about the book and its articles in the near future.